Mix one scoop )200g) in 400-600ml of water or favourite milk. Then blend, shake or stir for 20-30 seconds or until powder is disolved. Struggle to add muscle gains to your body? 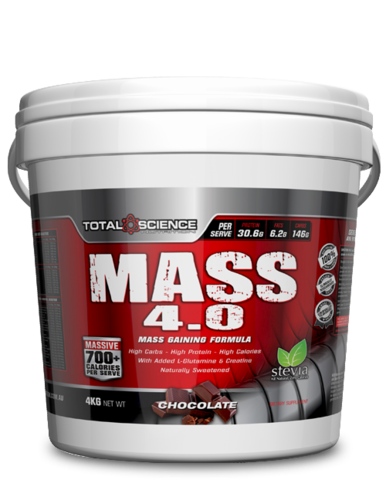 Total Science Mass 4.0 is a quality mix of ultra-filtered whey protein concentrate, milled oat powder and medium chain triglycerides with added creatine and L-glutamine, to support serious muscle gains. This formula provides protein to continually feed and nourish your muscles. With 6.2g of fat from high-performance MCT oil (medium chain triglyceride) to support performance by increasing energy without having it stored as fat. MCT allows for a slow and steady release of energy without increasing serum cholesterol levels. Each nutritionally complete dose supplies your body with over 30.6g of protein, 6.2g quality fats and 146g of complex carbohydrates, to support those lean gains. Mass 4.0 comes in four great flavours, Vanilla, Honeycomb, Banana and Chocolate and is naturally sweetened with Stevia to enhance the flavour profile naturally.